The NOTHING TO DECLARE Essay Writing Contest aims to encourage art criticism and promote a deeper understanding of the exhibition among student viewers. The essays we are looking for will address, refer or respond to the exhibit NOTHING TO DECLARE which will be exhibited at the Blanc Compound (359 Shaw Blvd Interior, Mandaluyong City), UP Vargas Museum (University of the Philippines, Diliman, Quezon City), and Yuchengco Museum (RCBC Plaza, Ayala Avenue, Makati City) from October 18 2011 to 29 January 2012. The Contest is open to all college undergraduate students. The contest is open to all individual college undergraduate students. Contestants should have seen the exhibits (at least one venue), and signed the attendance sheet. This entry form will be attached to the submitted essay and will serve as the contestant’s duly signed certificate of originality. Entry forms should be accompanied with any proof of enrolment, such as the enrolment form or certification from the school. After viewing the exhibit, contestants can do their library and online research, request interviews with artists and curators, among others. The essay will be written individlly. Essays written by more than one author will not be accepted. 2. Submit an essay, in English, of not more than 1,500 words, Arial 12pt, double-space, and printed on letter-size paper (8½ by 11 inches) or A4 paper. 3. 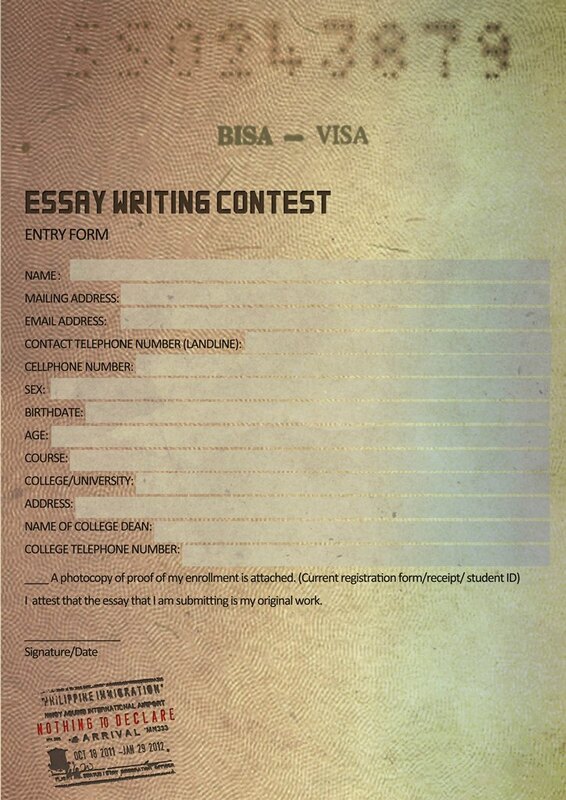 The essay should be placed in a short folder together wit the entry form and proof of enrollment. The folder should be labeled with the student’s name and school. All decisions of the Panel of Jurors, including the First Screening, shall be final. Winners shall be informed by email and SMS. Winners or his/her authorized representative are strongly encouraged to attend the awarding ceremony to personally receive their prize, venue and date to be announced later. Three winning entries will be published in the Nothing to Declare blog, and venue websites, and the post-event catalogue. Prizes and awarding ceremonies will be announced at a later date.